Hexcel (Hall B6 – Stand 139) is promoting its leading range of composite materials for skis, snowboards and other high performance winter sports equipment at ISPO Munich 2018, January 28-31. To enable the creation of extremely lightweight components with no compromise in performance, technologies on display will include: HexPly® M78.1 fast-curing prepreg, HiMax™ engineered multiaxial reinforcements, and Polyspeed® pultruded components. 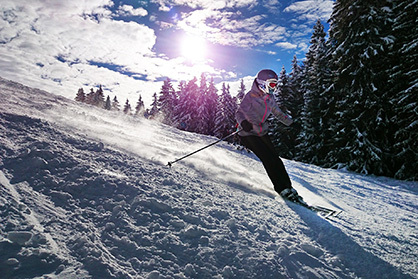 A key supplier to the winter sports market for more than 40 years, Hexcel understands the unique requirements of this fast moving industry, where the drive for higher performance means manufacturers continuously develop improved designs to exploit technological advances. Hexcel’s innovations in epoxy resins, carbon fiber fabrics, prepregs, laminates, pultruded profiles and polyurethane systems are enabling the manufacture of lighter, stronger and more durable skis and snowboards to answer the needs of world-class competitors, as well as the demanding sporting enthusiast. At ISPO this year, Hexcel will showcase the latest addition to its HexPly® prepreg range which helps ski manufacturers to reduce production cycle times. HexPly® M78.1 features a fast-curing epoxy resin matrix and is available with carbon, glass or aramid fiber reinforcements. It cures in just 7 minutes at 120°C, yet it has a long storage out life of 2 weeks at room temperature, meaning there is often no need for freezer storage, saving time and energy. HexPly® M78.1 is a low tack system making it easy to handle. It also provides excellent adhesion to auxiliary and core materials including aluminum, wood, thermoplastics and elastomers. Customers are finding that this new system provides greater flexibility in ski manufacture, enhancing the process and the quality of the final product. Hexcel’s HiMax™ multiaxial fabrics offer significant weight advantages for manufacturers of skis and other sporting equipment, where every extra gram of weight is critical in improving performance. Hexcel’s fiber-spreading capability allows the development of ultra-lightweight carbon multiaxials and the fibers can be placed in different axes to optimize the performance of the finished laminate. HiMax™ carbon multiaxials are available in a wide range of fabric styles, with weights per ply from as low as 50 g/m2, fiber orientations from 22.5° through to 90° in up to four layers, and a wide range of fiber types from 3k upwards. Hexcel's Research & Technology team collaborates closely with customers to develop fabrics optimized for their individual application and processing technique. A recent project involved the creation of a bespoke range of carbon triaxial reinforcements for a custom freeride ski brand, helping the customer deliver a product with a lightweight, soft flex and reactive ride whilst retaining strength and durability. Following the acquisition of Structil in October 2017, Hexcel’s product offering now includes Polyspeed® pultruded profiles produced at Vert-le-Petit, France. This latest addition brings pioneering expertise in the pultrusion of high performance unidirectional and orientated profiles, further strengthening Hexcel’s development capability and technologies. Polyspeed® pultruded profiles are used in several sports and marine applications including walking and ski poles, sail battens, stiffeners for skiffs and racing boats, kites, arrows, and stabilizing and extension devices for bows and crossbows. Constant section pultruded and pull wound profiles are produced in a continuous process with a variety of sections including tubes, rods and flat sections using carbon, glass, quartz and basalt fibres. Hexcel will show a small part of their pultruded product range at ISPO MUNICH 2018 and the technical team will be available to discuss any new applications with customers.